New Year is not just a night after which we hang a new calendar on the wall. It’s time to take stock and set new tasks. 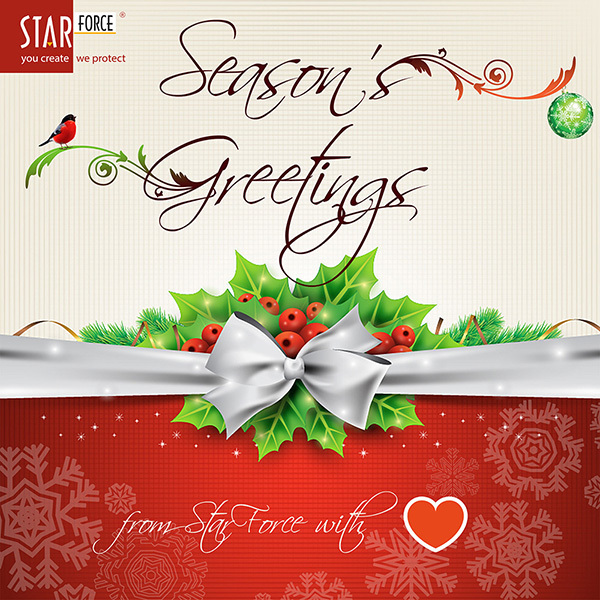 This year has been a good one for StarForce Technologies. We have completed the development of a multiplatform viewer for protected electronic documents. Red Bull Air Race, an amazing online game, has selected our solution to protect the gameplay against cheats and bots. SFLetter.com, our secure email service has entered the shortlist of Digital Summit Award. In 2017 we are planning to continue active development of our products. In the first quarter we will present USB Flash Drive binding for applications and audio/video files. Another feature to improve in the nearest future is periodic license confirmation. This parameter allows to manage access to protected files even after activation, what is very important for example for a corporate segment. I wish you to celebrate New Year the way you really want: enjoy a great party or quietly at home with your family. Let all your dreams come true! Take care and see you in 2017!